Michelle is a Certified Health Coach from the Institute for Integrative Nutrition. She suffered for years with IBS and anxiety, until finally healing herself through changes in diet and lifestyle. Her life’s reinvention has been documented in the movie “Lemonade” and she’s been featured on ABC, NBC and NPR with her inspiring story. Visit FindYourBalanceHealth.com for recipes and healthy ideas. Who are you today? What event has defined your life? I am a woman who has it all, for better or worse! I get to be a mom and an entrepreneur. I get to stay home and care for my son, and also work with women all over the world. The event that changed my life was getting laid off from the advertising job I hated. That led me to start my health coaching business. Of course, giving birth was another extremely life changing event! Anxiety and digestive trouble haunted my 20's. Definitely a huge challenge! It's amazing how a diet of real, whole food can make everything better. I changed my food and changed my life. “Everything in moderation.” My mom always said that when I was growing up. A little bit of makeup goes a long way. And earrings. And jeans that fit perfectly. I feel beautiful when I've had time to put myself together. Before I had my son I would have answered “A day at the spa” or “A weekend at Kripalu”. Now, I consider myself pampered if I get to go to a yoga class, or if I sleep in past 8am – and I try to do both as often as I can! Isn't she beautiful? 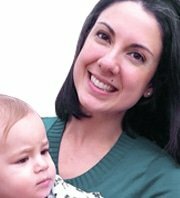 If you want to keep up with Michelle's amazing life, follow her blog at findyourbalancehealth.com!